Terra Basics is a locally run family farm based in Chichester, NH. Our farm and its many aspects consists of six family members (and a few others who stay with us from time to time), who are striving to live a simple, sustainable life while promoting the importance of stewardship of Planet and All that are therein. We grow fresh culinary and medicinal herbs, edible flowers, vegetables and a few small fruits during the New Hampshire growing season. Although we are dreaming about a greenhouse, we do own a Tower Garden and are working to grow small amounts during the winter months indoors. We offer dry herbs year-round. Both culinary and medicinal. We blend fantastic teas using many of our herbs and flowers. We are a USDA certified organic farm. Our gardens are also a Certified Wildlife Habitat. Look for all-natural, eco-friendly, sustainable household products from Terra Basics. When not in the garden, we continue to use our creativity by making some really cool items. Check out our product pages frequently as things change a bit around here. 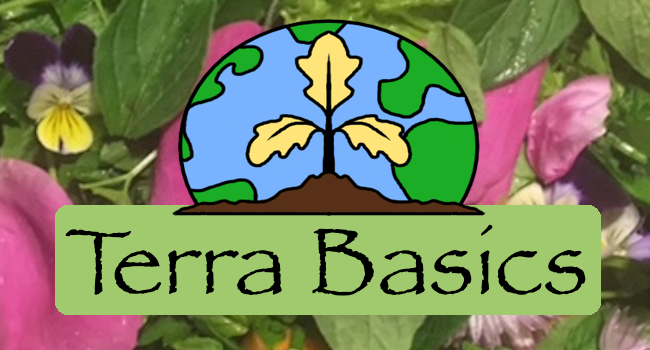 Terra Basics grows excellent herbs, edible flowers and vegetables that are raised using organic, sustainable practices so they are a benefit to our customers and good for the Earth. We create products that, both enrich and educate individuals about choosing products that support a healthy lifestyle and promote environmental sustainability and awareness. To produce local, wholesome and all-natural products designed to positively benefit the well being of individuals while reducing the negative environmental impact to our planet. Our founders and supporters are those who believe in reducing carbon-footprints and nurturing our earth, which starts with changing how we affect both. By using local, natural, recycled, up-cycled or recyclable supplies, Terra Basics develops earth-conscious product lines.